As I conveniently had some duck fat stored in a jam jar in my fridge, I though what better way to use it than on this post – I’m pretty sure an old shoe cooked in duck fat would somehow be delicious. Preheat your oven to 450° F. Slice the Brussels sprouts in quarters. Heat up a large frying pan and start melting the duck fat, add the Brussels sprouts and sauté to coat thoroughly. Add the shallots. After the sprouts start browning slightly, place the pan in the oven and roast them for about 20 minutes, stirring once about halfway through. After removing the sprouts from the oven, I divided them into small gratin dishes, and stuck them under the broiler for a couple of minutes before serving. This second recipe is so quick and easy. You can use however many sprouts you want, I used about a pound. Slice them in half, and lie them flat-side down on a sheet pan. Spray them with a little olive oil cooking spray, and sprinkle with salt and pepper. Roast them for about 20 minutes, or until they are slightly crispy and browned. Scrape them into a serving bowl, grate a bit of parmesan cheese on top, and add some toasted pine nuts if you like. 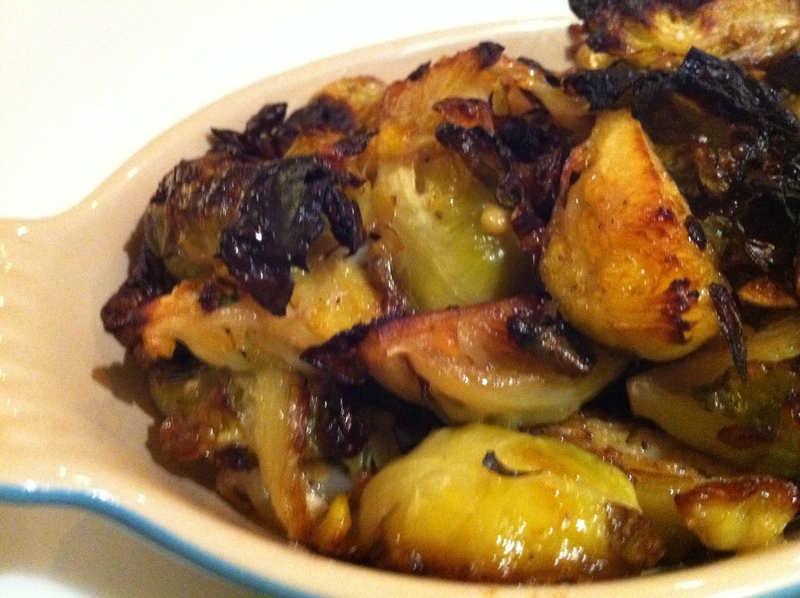 Although recipe #1 was absolutely incredible, the flavor of the Brussels sprouts shines through much more in recipe #2. So the choice is yours, artery-clogging, or light and flavorful goodness! This entry was posted in Brussels Sprouts and tagged brussels sprouts, cooking spray, diet, duck fat, parmesan, pine nuts, roast, shallot. Bookmark the permalink. delightful. i just had these at the smith last night. love me some sprouts.